Always pre-test carpet or other fabric materials to ensure that they are colourfast. 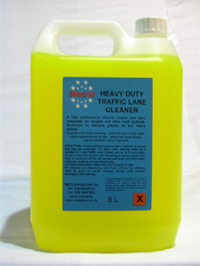 For heavy duty cleaning make up a solution of 1 part Traffic Lane Cleaner and 5 parts warm water. Spray or brush the solution into the soiling and gently agitate until stain is removed. Lift the residue and rinse with clean water. Clean the carpet by normal shampooing. For lighter applications dilute with up to 20 parts of water.